Although it's known as as one of the nation's best university towns, Chapel Hill offers something for everyone with a great variety of affordable and beautiful homes for sale. As the city's largest employer, many homes in the area are owned by university employees or students looking to save money on rent. This makes Chapel Hill, NC homes for sale ideal for first-time buyers, although don't write the town off as a cheap and easy market, there are still plenty of luxury homes in the area. Discover your dream home in this charming community by looking through the latest listings or continue reading below to find out more about Chapel Hill real estate. Listing Office: Terramor Homes, Inc.
Never Miss Another Listing Again. Get unlimited access to the latest homes for sale before your competition. Bookmark your favorites, save your custom searches, and so much more! Don't just take our word for it. Experience it for yourself now! Market Summary: The students are gone for the summer but the housing market is still chugging along. Year over year pricing is up 4.83% and the price per square foot on average is $184 per foot. Days on Market stopped falling and remains at 49 but this is still very low. The inventory is very low and right now the average price of homes listed for sale is $669,818. 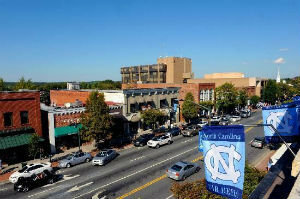 Owners of Chapel Hill real estate have noticed a generous growth in property values over the past few years. As you drive, bike, or bus through the picturesque tree-lined streets in Chapel Hill – it's known for its exceptional, and free, transit system - you will notice some major real estate trends. Many properties in the area prominently feature traditional brick, painted shutters, and other classic southern architecture. These properties evoke charming small-town flair while remaining modern and energy-efficient on the inside. Many properties feature renovated rooms, upgraded bathrooms, kitchen additions, and other upgrades that take the property from the good old days to the future. Newer homes in the area include bright windows, pot lights, walk-in closets, spa-inspired bathrooms, and more. These properties range in price depending on their proximity to the charming downtown core of Chapel Hill. Most homes also include single or double car garages and ample yard space perfect for throwing a baseball around or soaking up the sun with the family. No matter what your budget, this charming village has a home for you. The city enjoys one of the highest income and educational family averages within the Triangle region (The Research Triangle Park is a Tax Free Zone located between Durham, Chapel Hill and Raleigh, NC). There is a strong community base, yet for all its growth, there remains the feel of a much smaller town. Learn more about real estate news, our favorite restaurants, activities, and more in Chapel Hill! With its vibrant southern charm, clean streets, and supportive community involvement, Chapel Hill is the place to be if you want to raise a family, get a world-class education, or enjoy your retirement. Residents of Chapel Hill feel immense pride in their little city. From bragging about the world-class University of North Carolina (UNC) or painting the town “North Carolina Blue” on a college game night, the community involvement in Chapel Hill is palpably high. In addition to community pride, homeowners also enjoy the clean, safe streets in the area. The city is well-kept and maintained, preserving the idyllic ambiance in the area. The downtown core of Chapel Hill is home to numerous shops and eateries including some of the best burger and barbecue joints in the state. Patio dining is popular when the weather is nice as well as fine dining with farm-to-table ingredients. Healthy living is an important part of Chapel Hill culture. Residents enjoy three large farmer's market throughout the year as well as easy access to numerous parks, recreation centers, and greenways. Chapel Hill is also committed to sustainability. It is a bike and pedestrian-friendly city with a fare-free system that makes leaving your car at home and taking the bus an appealing option for many. Only a mile from UNC and the center of the city you'll find the neighboring city of Carrboro. Take Chapel Hill, add a little more music and art, throw in a good dash of diversity, and (of course) The Weaver Street Market and you have the great town of Carrboro, often which refers to itself as “The Paris of the Piedmont.” Together both towns offer a great selection of fantastic restaurants, cafes, bars, art galleries and local stores create one of the coolest downtown scenes around. As the weather warms you will certainly want to visit one of the numerous Farmer's Markets. You can find one at the University Mall, Southern Village and Carrboro. Home to Al’s Burgers, widely regarded as the best burger place in town. The Carolina Basketball Museum is located in Chapel Hill, which holds decades worth of amazing historical artifacts from the history of basketball in the area. Arts and culture are alive and well in Chapel Hill at the Ackland Art Museum, a university museum that is also open to the public. The North Carolina Botanical Garden has numerous habitat displays all over providing a beautiful and educational way to spend more time outdoors. Chapel Hill has a healthy nightlife with many indoor and outdoor venues for live music as well as its very own video game arcade bar! If you or your family are looking for more information on the best neighborhoods in Chapel Hill, please contact the My NCHomes team online or by phone at (919) 967-6363. Larry Tollen, and My NCHomes wrote the book when it comes to helping buyers get the best deal on their new home!